A place to dream and relax. Here you can just lie back and enjoy. Typical Greece: Grace Mykonos houses are also white in color. The bright decor of the bedroom ensures a feel-good atmosphere. Furnished with great attention to detail, the rooms leave nothing to be desired. The rooms are simple, yet lovingly furnished. The modern bathroom ensures a good start to the day. Unwind at the inviting outdoor pool. A very special atmosphere prevails at night in the all-day dining restaurant. 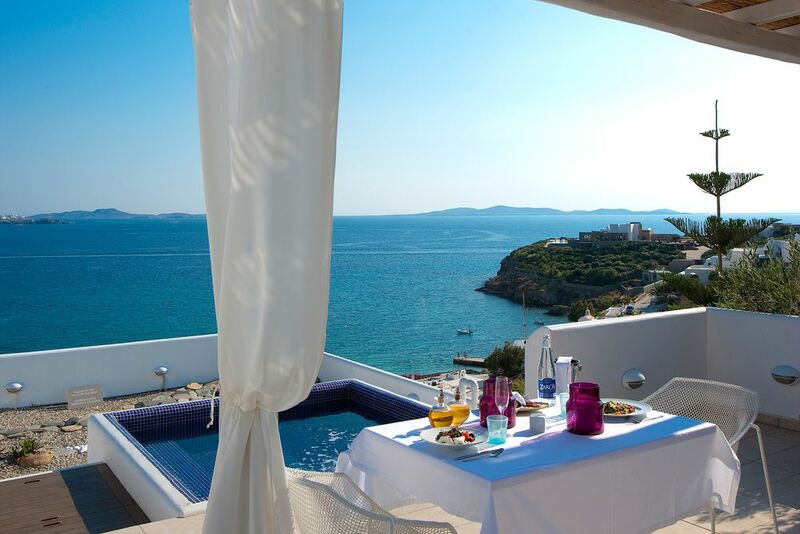 Enjoy the undisturbed sea view from the private terrace during breakfast. The lounge invites you to relaxing afternoons. 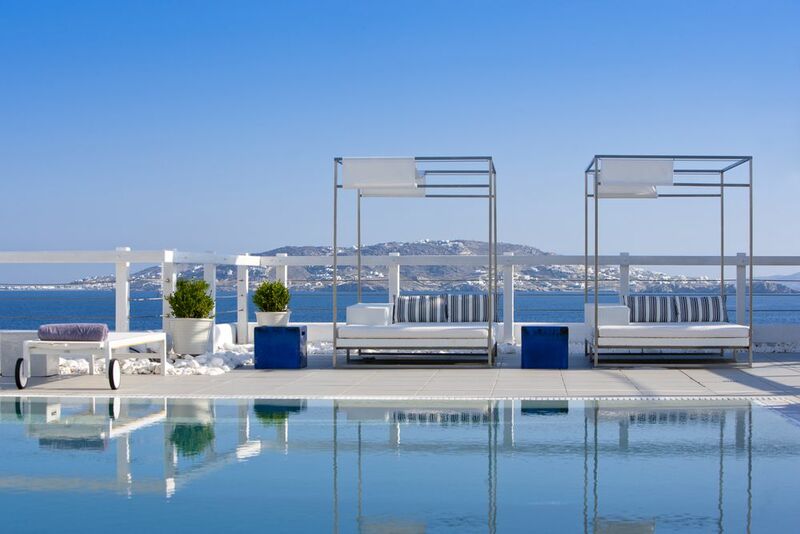 Make your next holiday a relaxed and pampered Mykonian island getaway at Grace Mykonos — where guests are treated to an ideal setting, consisting of luxurious facilities and warm hospitality for a unique hotel experience. Mykonos Island is one of the most popular islands in Greece because of its idyllic beaches, stunning sea views across the Aegean and romantic taverns tucked away down quaint streets. Enjoy a lively cosmopolitan ambience with a buzzing nightlife, shops and an array of sport activities that appeal to all types of guests. 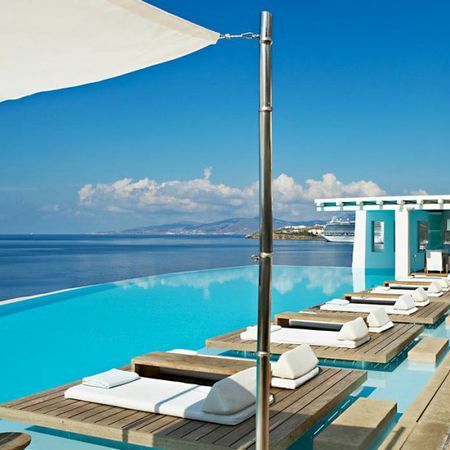 Grace Mykonos is situated in the northwestern part of Mykonos Island. It is the ideal starting point to discover the popular island and the array of activities that it offers. Relax under the Greek sun by the stylish poolside area or down on the sandy shores of Agios Stefanos beach. 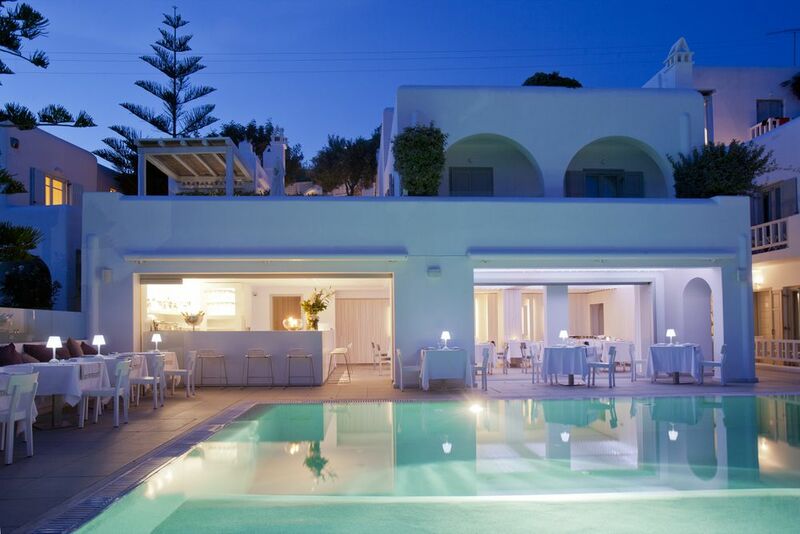 Grace Mykonos is fifteen minutes away from the airport. The perfect combination of traditional architectural elements and local craftsmanship with modern facilities and simple yet elegant design can be seen throughout the property, representing Mykonos accommodation at its very best. 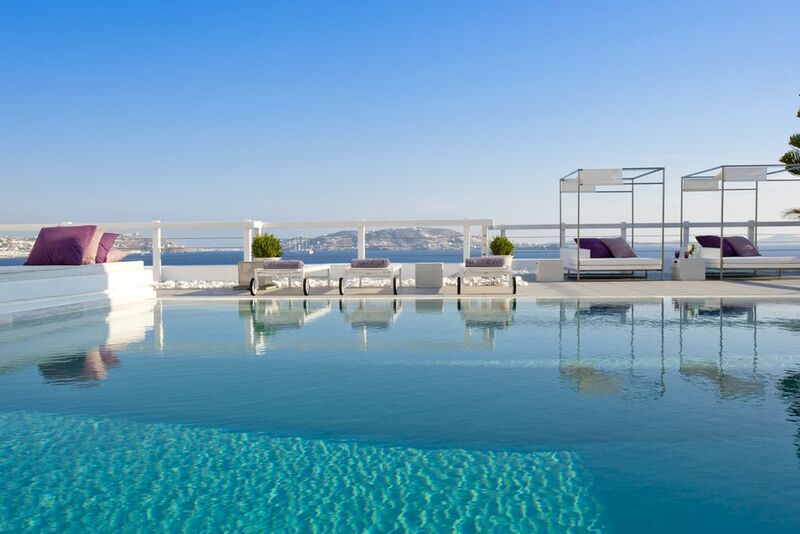 Grace Mykonos is a true sea hotel that will satisfy all desires. Grace Restaurant is located on the pool level, where guests enjoy daily breakfast options, mouthwatering lunch menus, and a fine gastronomy experience in the evening. Complemented by impeccable sea views and Delos Island, your culinary experience will be one that you will never forget. In addition to a 24-hour front desk, there is maid, concierge and laundry service. The hotel also offers special children’s menus, babysitting services, a small business center and a lounge with a TV and library. 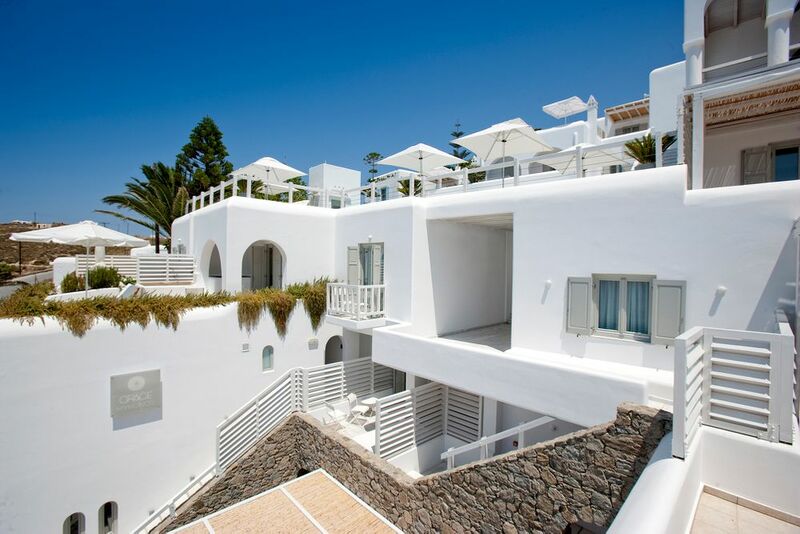 The Grace Mykonos has 32 elegant rooms that combine traditional architecture with modern amenities. The luxury rooms and deluxe hotel suites allow guests to indulge in high-spec furnishings, spacious bathrooms (all with walk-in showers), sumptuous beds and the latest in-room technology. Amenities include wonderful sea views, king-size beds, air conditioning, telephone, minibar, coffee maker, Wi-Fi, iPod speakers, flat screen TV, DVD player, safe, bathrobe and slippers. Deluxe Room (20 sqm)— These rooms have a spacious bathroom and balcony overlooking the beautiful sea. For a maximum of 2 people. 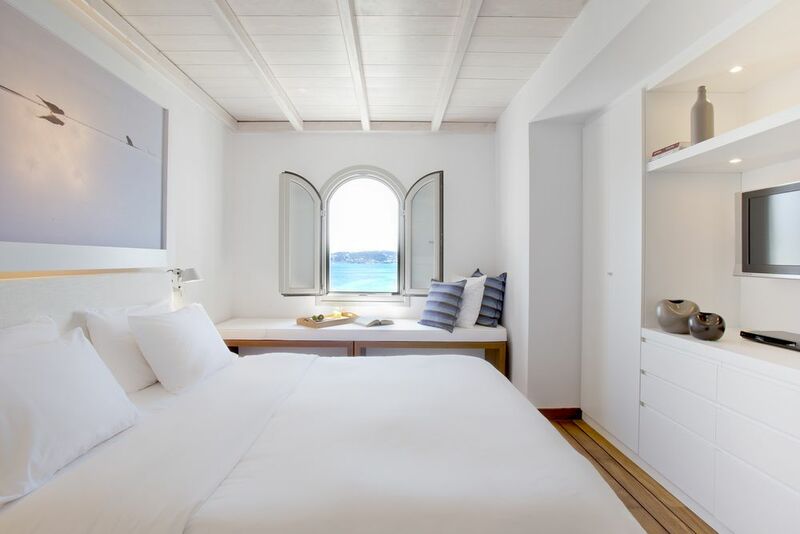 Junior Suite (28 sqm)— Spacious room with additional couch that transforms into a guest bed and a lovely balcony overlooking stunning westward views to the sea and the town of Mykonos. For a maximum of 3 adults or 2 adults and 2 children up to 11 years. Deluxe Room with Plunge Pool (19 sqm)—Enjoy a large outdoor terrace, sunbathing area and small plunge pool. For a maximum of 2 adults. Junior Suite with Plunge Pool (28 sqm)—The large terrace and small plunge pool overlook the stunning surroundings for an unforgettable holiday. For a maximum of 3 adults or 2 adults and 2 children up to 11 years. Family Suite (40 sqm)—Located above the pool, these suites have two bedrooms (one with a king-size bed and the second with two single beds), a bathroom and a balcony from the master room overlooking the stylish pool area. For a maximum of 4 people. Family Suite with Plunge Pool (40 sqm)—These suites have two bedrooms with king-size beds, two bathrooms, and a terrace with a small plunge pool and sunbathing area. For a maximum of 4 people. VIP Suite (43 sqm) —Enjoy a large bedroom, sitting area, veranda with sun loungers and a private plunge pool! For a maximum of 3 adults or 2 adults and 2 children up to 11 years. 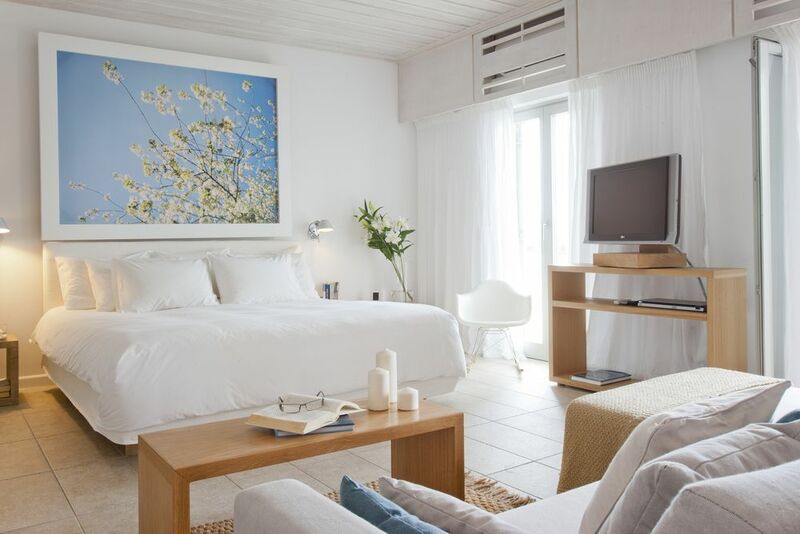 Honeymoon Suite (33 sqm) —On the top floor overlooking the beach and Mykonos town, these beautiful suites have a roof terrace with a plunge pool, living area and a second terrace. For a maximum of 2 adults. 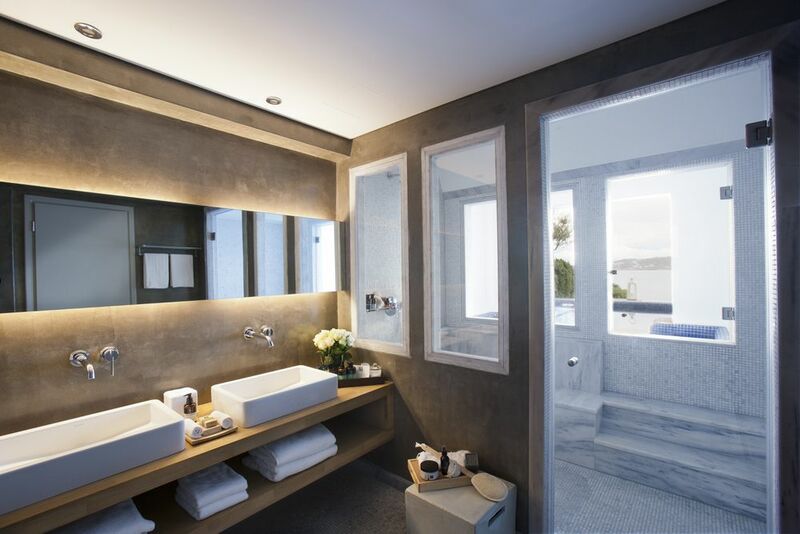 The Grace Mykonos offers a small spa area with a steam bath, sauna and treatment rooms where you can enjoy an array of treatments and massages. You can also enjoy these options in the comfort of your room.